The 13th Kyoto University International Symposium. 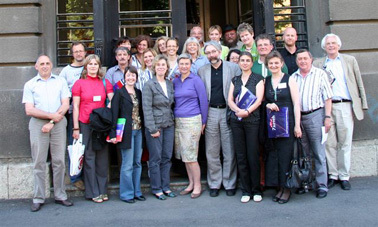 The European Commission organizes a Culture Programme Conference 28 September 2009 in Brussels to present past and ongoing projects (funded by Culture 2000 and the Culture Programme 2007-2013) and to encourage exchange of experience and good practice between cultural operators. Carnival King of Europe has been selected to be part of the event. The Museo degli Usi e Costumi della Gente Trentina participates with "Carnevale nostro contemporaneo"
SESSION 1: Crisis for ethnology and the reconciliation between ethnology and anthropology. • 10:30 - 11:00 Orvar Lofgren (University of Lund) Researching the backyards of modernity. On the power of the insignificant. In the heart of winter, a very ancient ritual to secure prosperity and good harvests is held throughout Europe, at the original core of what is commonly known as Carnival. This film is made under the assumption that Carnival reveals similar actions and similar characters, cast in very similar original patterns all over Europe. In this sense, Carnival's ephemeral kingdom of misrule can be said to be one of the longer lasting in European history, and Carnival himself a veritable "King of Europe". 3 carnevali e ½, DVD - 52' - MUCGT, 2007. One day in Valfloriana (Fiemme Valley), one day in Grauno (Cembra Valley), one day in Palù del Fersina (Fersina Valley) and one day in Varignano (Arco), the film follows three (and one half...) of the most significant traditional Carnivals that still take place in the valleys of Trentino. Far from the prevailing format of the masked pageant, in reality these carnivals are closely reminiscent of the winter fertility rituals that are found in all Europe. • Tutti uguali perché tutti diversi. Per una riscoperta delle continuità nella vicenda culturale dell’Europa. • I rituali mascherati della Bulgaria.